From homemade tortillas to housemade pasta, this was the year of making things -- and making them better. Food trucks leapt into bricks-and-mortar spaces, cooking schools became food counters, and a couple great little restaurants found bigger and better homes. We also saw our favorite chefs elevate their businesses by making key components of their dishes from scratch -- and better than anyone else -- be that Dutch pancakes or Turkish pide, tall cakes or fat biscuits, or maybe just a really impressive swirl of soft-serve ice cream. Charlie Dunmire’s stunning cakes -- and the amazed audiences -- outgrew her Airstream trailer this year and upgraded to a historic grocery store. At the new location, Dunmire -- who named her cake shop for the cooking she once did on a ship out of Alaska -- renovated the space and expanded her menu. Now she can offer her signature London Fog (Earl Grey cake with honey and Earl Grey syrup, bergamot mascarpone cream, and cream cheese frosting) along with another half-dozen or so options of cake and cupcakes every day, drinks, and a small selection of local sundries and supplies. 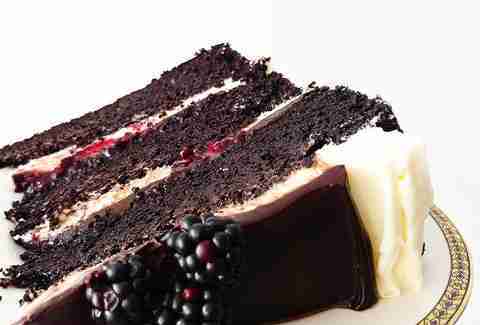 The cakes, though, with their towering layers and utterly Instagrammable decorations, are the draw, tempting diners with fun flavors like molasses stout or pistachio lemon, but cementing their fandom with the balanced, beguiling execution which is never too sweet and always delivering on the promised flavors. There are four menu options each day at this counter, tucked into a corner above the Pike Place Market’s atrium -- the home of Honest Biscuits, before it expanded to the new Market Front. All incorporate the freshly made pasta by owner Michela Tartaglia with the impeccable ingredient sourcing of her business partner, Nathan Gottlieb. The menu, which changes every two weeks, has only one each of a meat, seafood, and vegetarian option, plus the lasagna, available every day. Each pasta is paired with the sauce that matches it -- spaghetti alla chitarra with Alaskan cod, artichoke, and capers, or fusilli with delicata squash, burrata, Calabrian chili oil, and Nigella seeds, for example -- and speaks to the precise season, demonstrating the flexible beauty of the rustic Italian cooking by Tartaglia. Miri’s started in a little shop up the street before taking over the concession stand this summer at Golden Gardens, bringing mini-pancakes, sandwiches, and cucumber limeades to the beach. The poffertjes -- little Dutch pancakes -- that made Miri’s famous come in a variety of flavors including melted butter with powdered sugar, chocolate hazelnut spread with banana, and seasonal jam or berries with whipped cream. 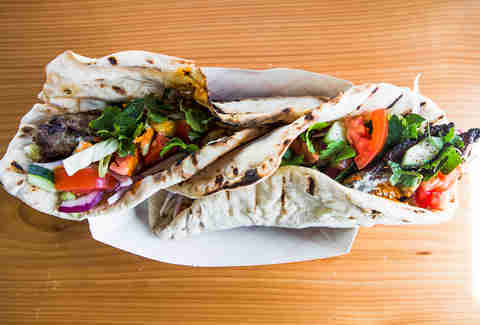 The rest of the menu is all over the place, as little logic seems to tie together the kebab sandwiches, acai bowls, and big salads, but everything on it makes for good eating on the sands of one of Seattle’s best beaches. And who is going to complain about homemade flatbread, Full Tilt ice cream bars, and a plethora of tiny pancakes? Nobody, that’s who. This former food truck had plenty of fans from its mobile days, but settling down in Fremont, in an adorable stand-alone building, it expanded its menu (and its audience). First, there was the addition of drinks -- biscuit brunch goes way better with Tang mimosas and cereal-milk punch. But beyond the bar, it also meant that they could fry. And fry they do -- mostly a crisp chicken that goes inside the fluffy biscuits along with pickles, sweet onion mustard, an egg, and gravy on the “Gus.” They also serve the same chicken over another addition to the menu: bourbon green onion waffle with bourbon maple syrup. Grits, New Orleans-style shrimp, and numerous other major plusses came to the menu with the bigger, stationary kitchen, but the most important thing is that the biscuits have remained as big and fluffy as ever. 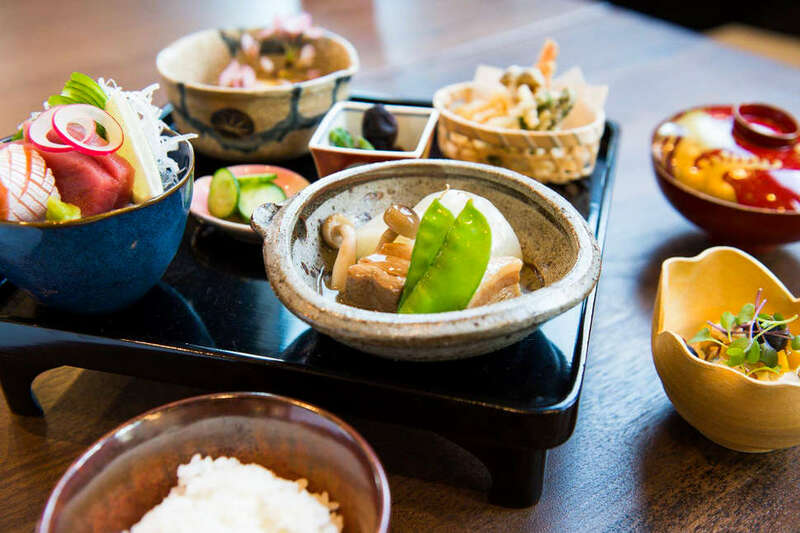 While most of Seattle’s (excellent) Japanese fine-dining restaurants lean toward sushi, this spot bucks the trend, bringing the multi-course Japanese tradition of seasonal tasting menus called kaiseki back to town. 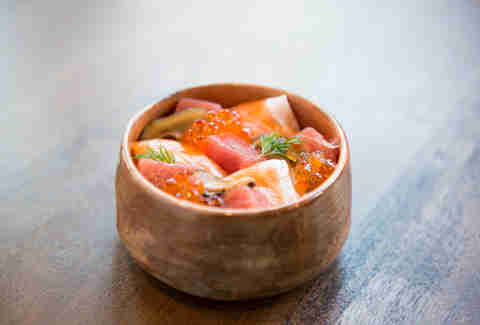 At the chef’s counter or the simple tables in the somewhat ordinary, box-like room, each of the five to ten courses (depending on the night and menu) comes beautifully presented, with ingredients that adhere strictly to the season. The courses are delightfully light, leaving room for excitement for the next course straight from the dashi-braised daikon to the yam ice cream. Luxury ingredients, like grilled halibut cheeks and truffles weave into the menu, giving it an affordable fine-dining feel, but the meal also pauses for fun touches -- like the candy corn garnish on the fall dessert. All is best washed down with a recommendation from the sake list -- or the full complementary pairings. After winning on the Food Network’s Chopped and beating Bobby Flay, Aarthi Sampath looked for her next move: a food truck that combines her Indian heritage with her Asian cooking expertise, along with a few other flavors she picked up on the way from Mumbai to New York City and on to Seattle. The star of the brightly-colored truck’s menu is the BBF biryani (the one that beat Flay), using her Kukree grain blend of quinoa, millet, and Amaranth as a vehicle for traditional biryani flavors -- along with cucumber-mint yogurt, eggs, and chicken. Other dishes, like the Asian Hanger steak, are a bit more eclectic, with cherry kimchi dressing, miso cauliflower, chard, and yellow beans. All, however, go great with her signature “very hot” sauce. 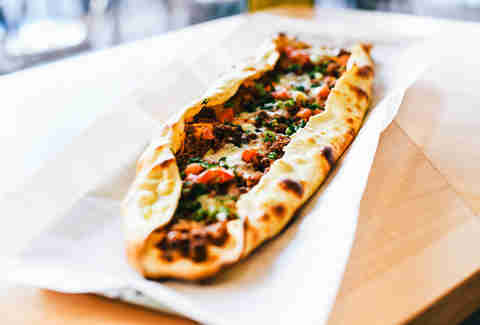 Pike Place Market got its second Turkish restaurant this year, this one an adorable, pastel-adorned homestyle Halal cafe specializing in meat-stuffed flatbreads called pide. While the stalwart Turkish Delight focuses on flaky börek, here you’ll find chewy, charred doughs baked around fillings like a ground beef with pepper and onions, chicken with tomatoes, and Turkish beef pepperoni with mozzarella cheese. There’s even a sweet pide with tahini and honey. The menu has a few other options, including lavash-wrapped kebabs, Turkish dumplings served in butter and yogurt, and a dessert list that offers options found nowhere else in town, like the cheese and crisp noodle sweet called kunefe. Wash it all down with the Turkish teas, coffees, or yogurt drinks. Technically, this big, bright pho restaurant opened in the last days of 2017, eking in after the best new restaurant lists and just in time for an epic New Year grand opening. Fitting, because this pho shop is here for the party: giant, Flintstone-esque short ribs protrude from the shiny silver bowls, a neon sign declares this the “Phở-Cific Northwest,” and the wine list leans natural and quirky. Take a shot of pho-infused bourbon and wash it down with a chaser of pho broth: This is the same pho the Pho Bac restaurants have been famous for for years, but with a modern, Instagram-friendly edge. The classics stay on the menu, but they come with a side of prawn ceviche, Vietnamese sliders, or French fries with garlic lemongrass sauce. If you haven’t heard about Homer’s soft-serve ice cream, you may have been hiding under some sort of terrible rock that hates good things, but you could be forgiven for not having heard about the incredible restaurant from which it came -- it’s hard to pay attention past the colorful swirls of fig leaf and nectarine ice cream. 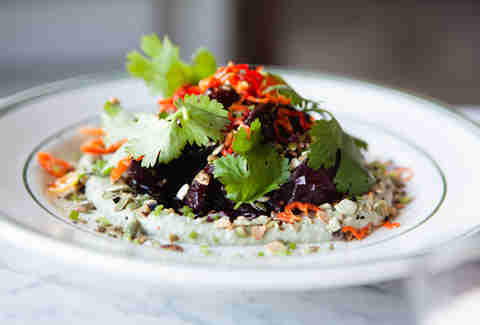 The Mediterranean spot from former Sitka and Spruce sous chef Logan Cox and his wife, Sarah Knowles, also serves a menu full of hummus, wood-fire-roasted meats, and eclectically spiced delightful small plates. But beyond a spread of charred cabbage with cheese and salmon with chanterelle stew, this spot is known for its warm, friendly service that matches the welcome of the adorable patterned wallpaper and bright ocean-blue accents. A rare breath of affordable, fresh food air in a season filled with bigger-budget openings comes in the form of a tiny taco counter. When the teriyaki vendor vacated the kitchen space inside Hillcrest Market, it didn’t take long for Carmelo Gaspar to notice and ask the owner if he could take it over with a taco stand. And it took, perhaps, even less time for locals to notice that the run-of-the-mill shop was suddenly sporting some seriously good tacos. The tiny menu offers Mexico City’s usual styles of tacos -- al pastor, asada, and campechano (mixed meat), along with a potato-based vegetarian option. The fresh corn tortillas -- a rarity in these parts -- take this spot soaring above the (rather low) Seattle standard, bringing in crowds each day to fill the fewer than a dozen stools.